Uc-Yule-let! | That's the life! 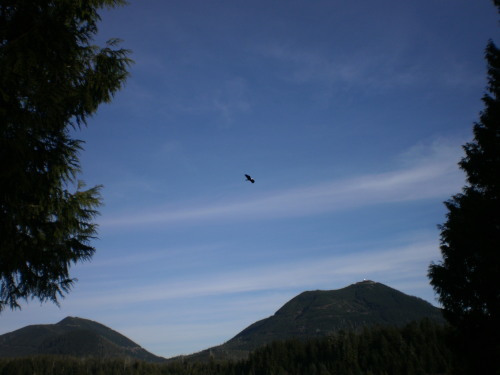 Where on earth is Ucluelet? 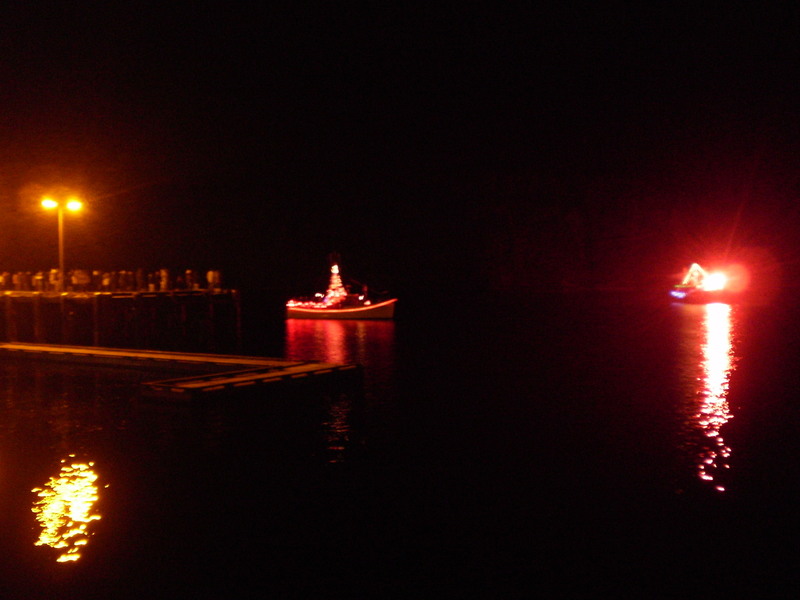 A few nights ago Kat & I went to see the Ucluelet Santa Claus Parade, which is called the “Sail Past”. What is the Sail Past, you might ask? 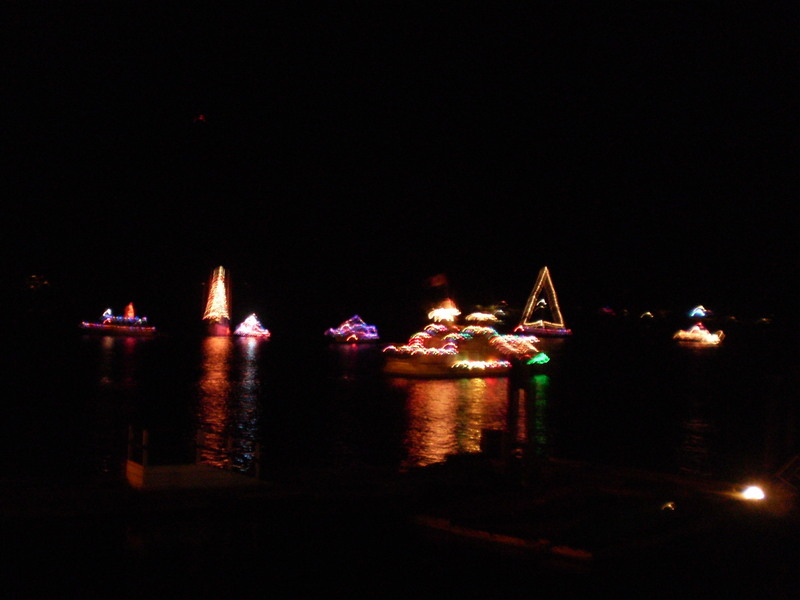 Well it’s when all the touring boats and fishing boats and schooners and wee zodiacs get gussied up with Christmas lights and then they sail past the main dock after nightfall. It was really pretty! Christmas lights look so lovely on the water. The boats puttered past and piroetted around each other, the reflection of the multi-cloured lights glittered in the ripples on the water. 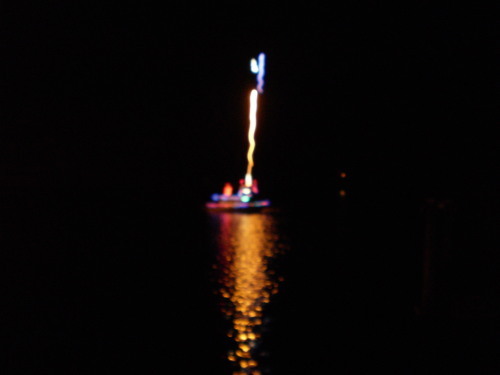 There were fireworks off of one of the boats, other boats had passengers with sparklers and a few even lit some bright crimson emergency flashes that sent pink smoke drifting eerily away on the crisp, salty breeze. Sail boats strung hundreds of tiny lights up the main mast to create tree shapes, fishing boats wrapped their gear in lights and one had an inflatable Santa flapping in the wind. Somewhere someone was shouting “Ho-ho-ho! 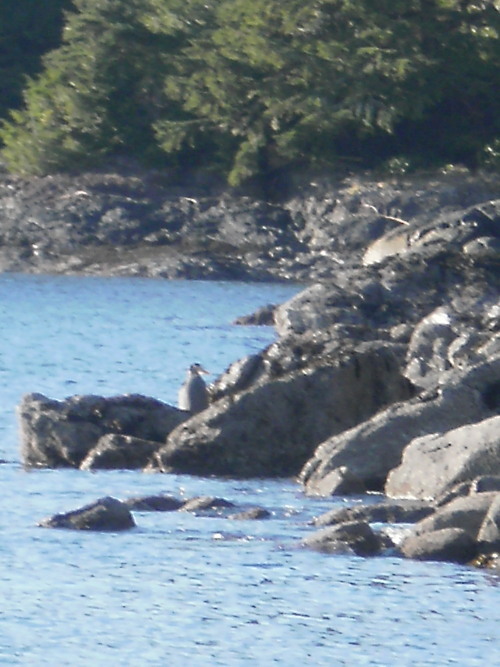 !” The sea lions barked back. Eventually the fireworks boat ran out of pyrotechnics and puttered away, and the people did the same. 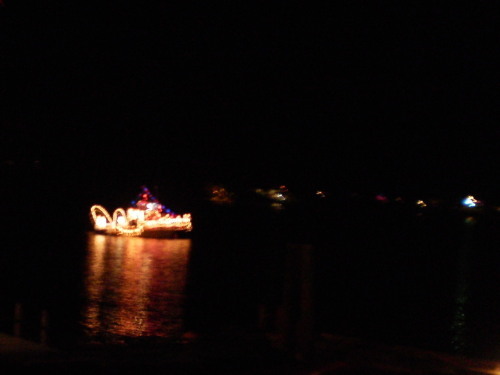 We biked home slowly, watching the twinkling procession as we followed the harbour side road home. 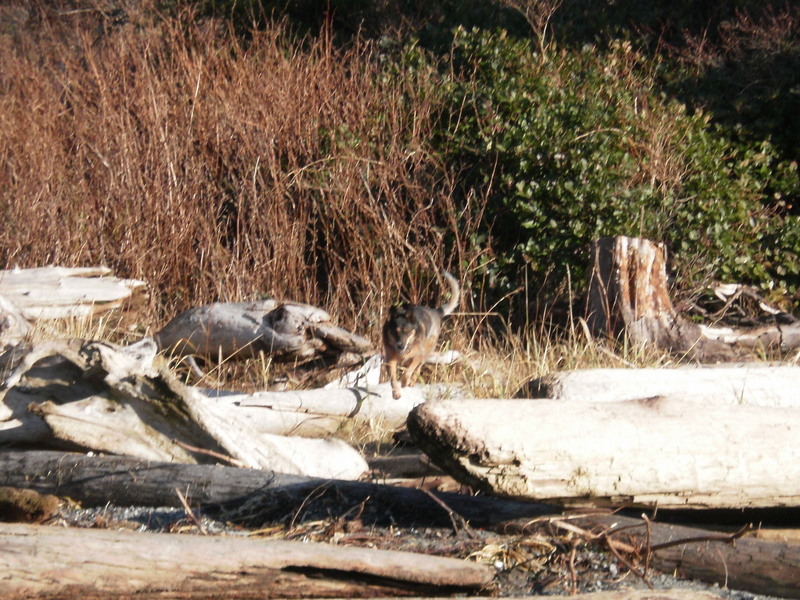 When he saw us he stretched out his neck and turned his head to get a good look at the dogs. Satisfied that we were not going to bother him, he settled his huge beak back on his chest and went back to gazing out at the ocean. 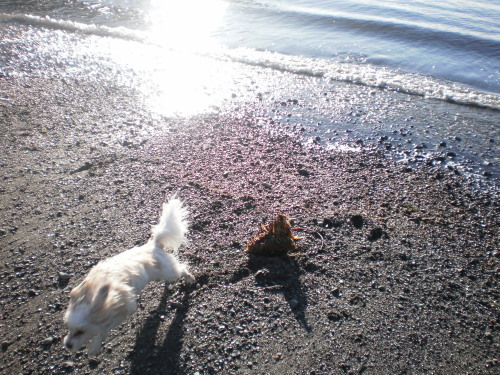 Bonus was struck with a case of the zooms and tore up the beach for a good ten minutes, running laps up and down the beach and vaulting over driftwood. He got Mocha a bit stirred up too. We went back to St. Aiden’s Church that evening for Christmas Caroling, but found the doors locked. We thought it started at 9:00, but we weren’t able to find any information, and the Church didn’t have a notice posted outside. No one was answering the phones and there wasn’t a voice message – I guess I should have written it down when we heard there would be caroling. I suspected it might begin at 9:30, but when we got home again we didn’t feel like going back out to try again. Instead we put on “A Christmas Story” (you’ll shoot your eye out!) and ate some of the German Christmas goodies my father mailed to us. I got a bit soused on brandy beans. Bright sunshine flooded the apartment on Christmas morning. We realized that we hadn’t opened any of the Christmas presents last night – and we had intended to! So we got right down to business over morning coffee. Kat gave me a pair of socks she had knit for me out of Noro yarn. I just love the pair she’d made me for Christmas/birthday last year, and had dropped a hint or two that it would be nice to have a second pair to wear when the others need washing. Wish granted! I gave Kat a skein of yarn I’d spun from some alpaca fleece (thank you for the roving Donna) and she was very happy with it. I’m looking forward to seeing what she makes out of it. We then ripped into the pile of wrapped goodies Kat’s parents had mailed to us a month ago. There were some treats for Kat & I and piles of toys for the critters! Bonus was intent on claiming everything, and he collected all the toys in his bed and hovered over them possessively. 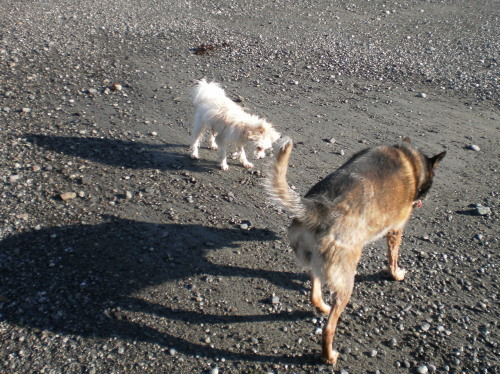 Mocha stalked up to him, plucked her pick from his pile and walked away. Our big plan for Christmas day was to build a campfire. Campfires have generally been a strictly summer experience, so the prospect of a Christmas campfire was a novelty and delight. “No! 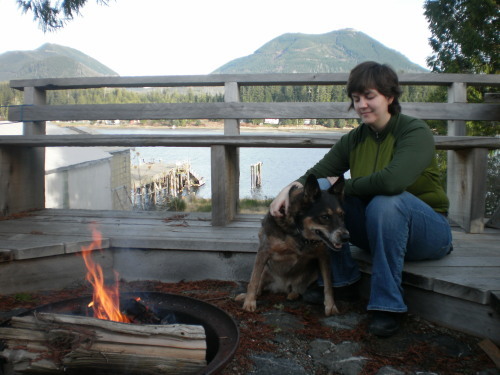 I mean get Bonus!” Here’s where having a good recall pays off – Bonus came trotting up to us when called, and we tethered him to a chair on the deck – close enough to the fire and to us that the eagle would leave him alone. 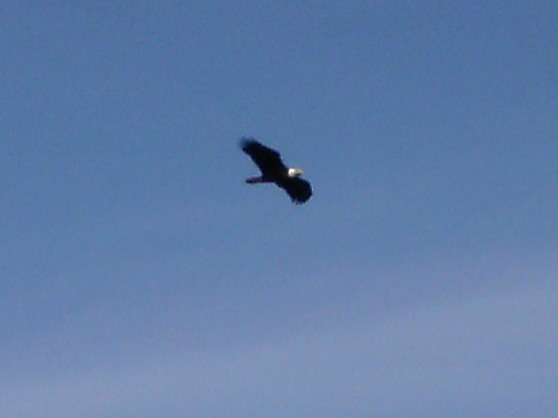 Bald eagles are more scavengers than hunters, but even so, we didn’t want our white, rabbit-looking little dog to tempt him. Mocha is a great campfire dog. She sniffed around the yard a bit and then settled down near the fire. We cooked our Christmas dinner over the fire. Kat made a bean-veggie-rice dish, and I fried up the big hunk of halibut Chris gave us last month. Oh, my, goodness. 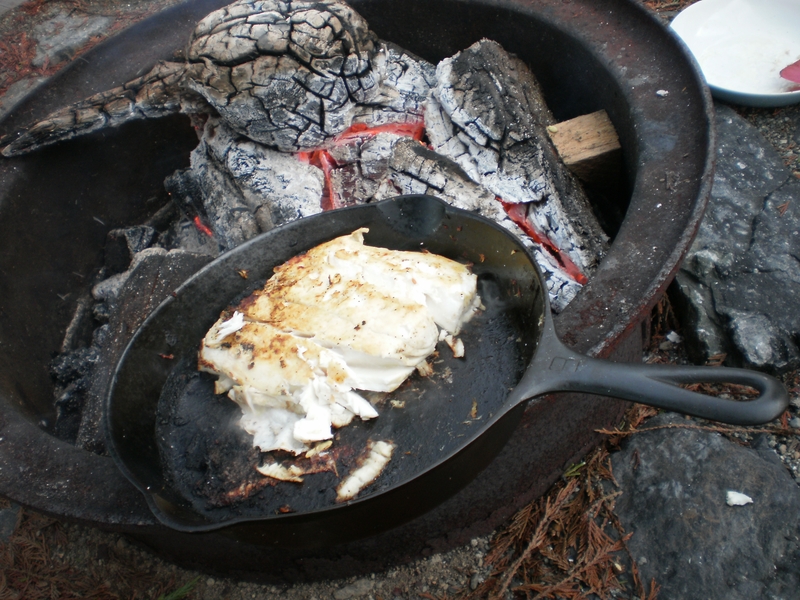 There is just nothing like fresh fish cooked over an open fire. I squeezed a bit of lemon juice over it and sprinkled it with some black pepper, but that was it. The rest of it was just honest halibut and cedar campfire smoke. It took almost ten minutes before the inch-thick steak cooked through enough to start flaking off at the edges. I picked at it with my fork and ate right out of the pan. I squished the halibut against the inside of my cheek and the juices flooded my mouth. It tasted a bit salty and sweet, a bit smoky, a tad lemony. So, so good. I took a mouthful. “MMMMM!” Another mouthful. “MMMMM! So good!” I just couldn’t carry on a conversation and eat this fish at the same time. Everything should be cooked over a campfire. We hung out by the fire the whole day. 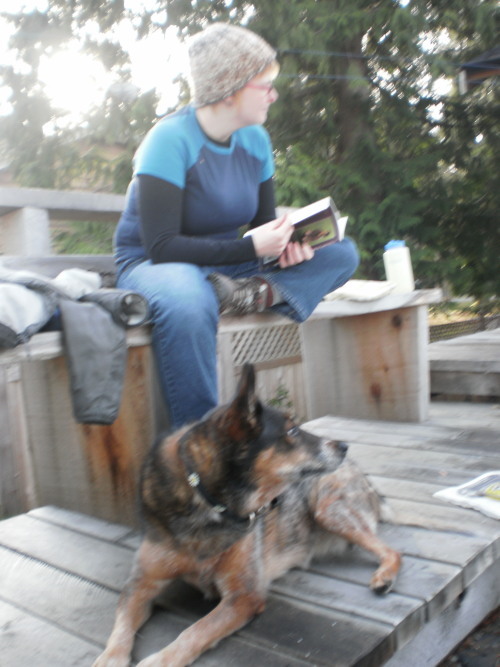 Playing scrabble, poking at the coals, boiling water for tea, cuddling with the dogs. You always *think* you need something to do in front of a campfire but you end up not doing much of anything, just watching the flames and talking, soaking up the smoke. Eventually the light faded and we packed it in. We soaked the coals and cleaned up all possible residue of food before going back inside. We put on that great Christmas Classic “It’s a Wonderful Life,” which I’d never seen before. Why that movie is so popular as to become a classic, I’ll never understand. Here’s this guy who reluctantly takes over the family business and gets married to a woman who has no desire to leave the small town he apparently loathes. He lives his whole life putting everyone else’s’ needs before his own until he resents his job and his family – he yells at his kids and hits his wife. Finally, he finds himself so depressed and crushed under the weight of responsibility that he’s ready to jump off a bridge. At this point an angel steps in and shows him what the town would be like if he’d never existed – apparently this guy’s existence was the only reason the town hadn’t descended into lunacy, alcoholism and debauchery. So our hero decides not to kill himself and that his life isn’t so bad after all – isn’t that touching? We needed some good humour to get all that wonderfulness off of us, and Stewart McLean’s Vinyl Cafe Christmas Classics did the trick. I just love Stewart’s stories. When he described the escape of a family ferret, Kat and I were in stitches. It was a great way to wrap up a wonderful Christmas day. Today, Boxing Day, we went back up to the lighthouse to watch the surf. The Pacific Ocean was rolling in great, foamy waves. 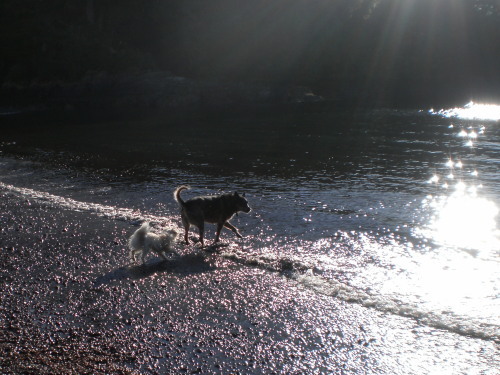 The sun shone through the rollers giving the tall waves a jade green colour. The white caps reminded me of whipped cream. 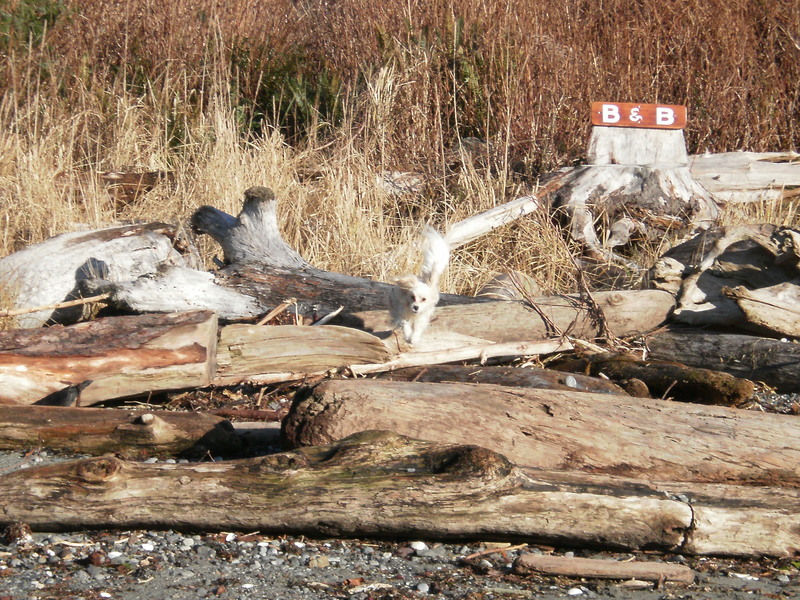 We sat on a bench, soaking up the sun, watching the ocean lurch and rise. The sun always seems to be low in the sky, it dazzled the eyes. I wished I’d brought my Tilley hat instead of my wool cap. « Shout out to the Ukee Locals! I really should be doing something else. Oh yeah, we have coffee!